During my growing up years in Mangalore almost every household that grew its own veggies on a small patch of land, usually a backyard garden, used to grow pineapples among other basic vegetables and fruits. It was nice to enjoy seasonal harvest throughout the year because apart from the fact that it was free, it was also organic. Although we didn’t grown pineapples in our yard we did enjoy some fruit that was grown in our neighbour’s yard which they occasionally shared with us. Honestly, I didn’t care much for free goodies then, I never valued them until I left Mangalore and have had to purchase everything. Having grown up in a neighbourhood that had a good mix of cultures I have had the good fortune of tasting food from every community in Mangalore. We had Havyaka Brahmins who lived in the next compound, where I spent many a joyous hours of my childhood playing with the kids there. Amma as we called their mother reared cows so that the milk could be sold – a way to make two ends meet. Whenever I visited their house (which was daily, after school) I kept myself busy in the verandah or within the compound, playing endless games of digging the ground, making mud cakes and castles, chasing butterflies and playing with their crazy, ferocious mongrel, Tiger. 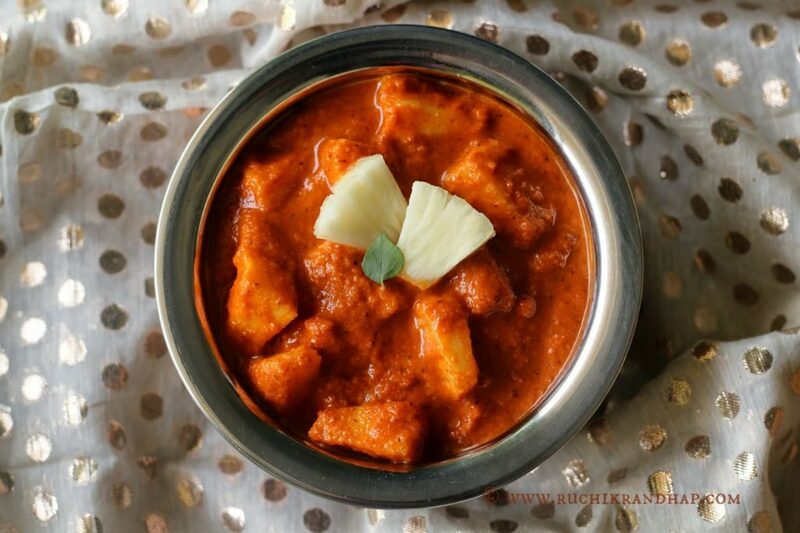 On the rare occasions when I played hide and seek inside the house, I was welcomed by the delicious aromas wafting from the kitchen where Amma was toiling over a simple, frugal Puli Koddel (sour, sweet and spicy curry with ash gourd or mangalore cucumber in it). She would then serve it with rice, pickle and papad and a side dish of another vegetable. This was their simple lunch. This Lent has given me an opportunity to explore more veg recipes that I had planned for. I have been trying out at least one new dish every day with a few hits and some misses. A few days ago I happened to chat with my co sister, Sumana and quickly asked her how she makes the ‘saasive’ (which means ‘mustard’) and she generously gave me her exact recipe. Thank so you so much Sumana for this lovely recipe! 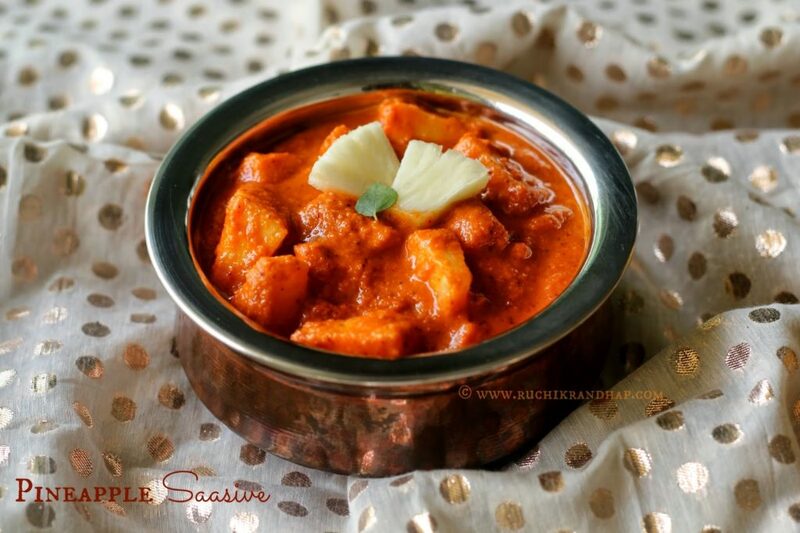 There are quite a few recipes for the pineapple saasive (not to be confused with pineapple menaskai which has a totally different masala). There is also another version with grapes in it – something I had eaten at a restaurant in Mangalore, hopefully this year when I am in Mlore for a holiday I will try and taste it again and recreate it. For now, do enjoy the saasive and do remember, this is a no cook method. 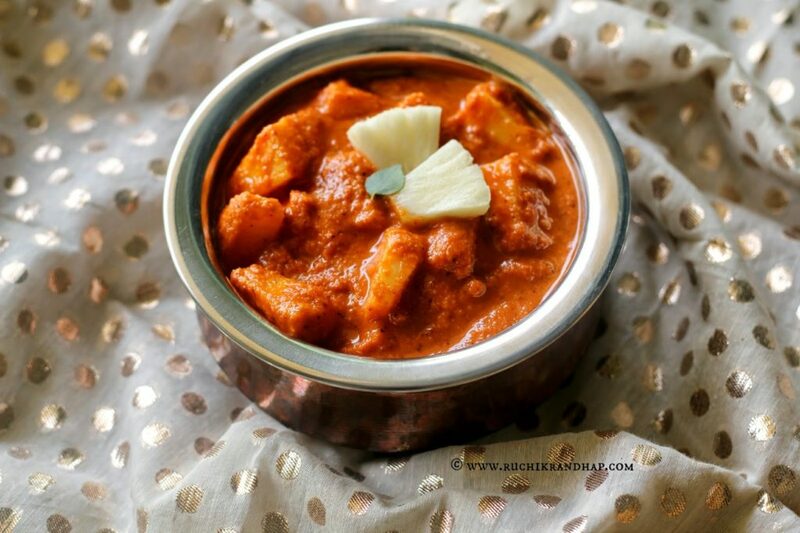 It is more like a chutney where you eat it raw, the pineapple pieces are just dunked in this masala, so make it and finish it up quickly. Tastes great as a side dish to a simple meal of rice and dal. 4. Transfer the ground paste into the bowl of pineapple, add a pinch of salt and mix well. 5. Serve as a side dish to rice and curry. 1. If you are unable to find fresh pineapple then buy the one which is packed in natural, unsweetened juice and not sweetened juice or sugar syrup. Drain the liquid before using, refresh the slices in plain water before using. 2. This is a no cook method, so it won’t last for long so make a small batch and finish it up on the same day. It may not taste very good the next day even if it has been refrigerated. 3. If you wish you may season the saasive with mustard and curry leaves but the traditional method is a no cook/no fire method – just grind, mix and eat!